The 2008 John Deere Gator 620i for sale is a 2008 John Deere Gator XUV 4x4 620i. The Gator has 1808 total engine hours. 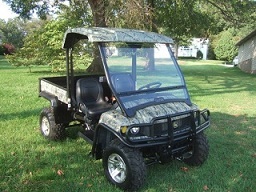 You won't find a nicer used John Deere Gator for sale has a top-front brush guard headache rack and a KAWASAKI ENGINE! GoGoCycles encourages our visitors to write a review of this model Gator to make the biker community aware of any problems that are commonly associated with the ATV or to highlight its positive features and help potential buyers make informed decisions. The 2008 John Deere Gator 620i is in Corning AR Arkansas and my asking price is only $6,950.00. If you're interested in seeing additional photos of the ATV call me (no e-mail) 870.857-3nine31 and please mention that you found my ad on GoGoCycles Used Motorcycles for Sale .